Share your photos on Instagram with the hashtags #schoolbustee and #oliverands. This style is provided as a digital pattern. It may be printed on both home printers (using either 8 1/2" x 11" or A4 paper) and at service bureaus that handle 36"-wide sheets. When you complete your order, you will be provided with a unique code to instantly download the pattern. See our digital product policy for full details. 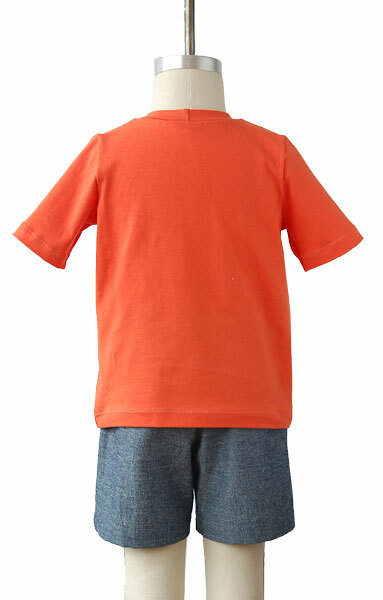 This basic kid’s T-shirt pattern can be made several different ways. With a long-sleeve and two short-sleeve options, you’ll get endless use from this easy and quick-to-sew style. 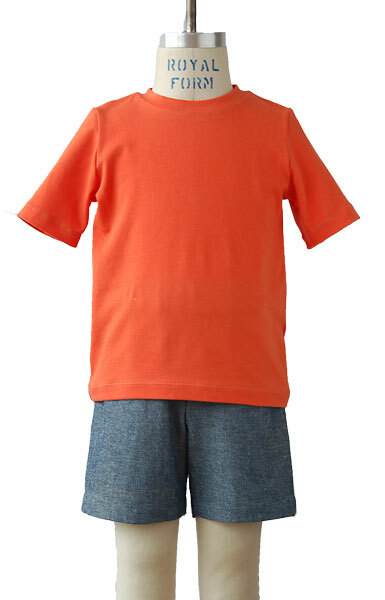 View A is a standard short-sleeve T-shirt while View B is a more feminine version with capped sleeves and a narrow neckband. After successfully sewing this pattern, you will have developed the following skills: knit fabric. Light- to medium-weight knits with at least 25% stretch. 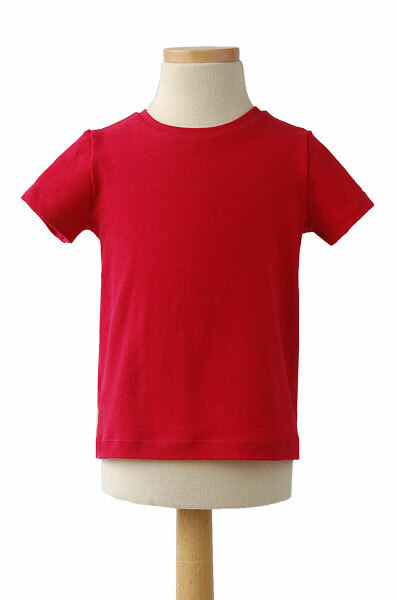 T-Shirt Chest 11" 11 1/4" 11 1/2" 11 3/4" 12" 12 1/2"
T-Shirt Length 13" 13 1/4" 13 1/2" 14" 14 1/2" 15 1/2"
T-Shirt Chest 13" 13 1/2" 14" 14 1/2" 15 1/2" 16"
T-Shirt Length 16 1/2" 17 1/2" 18 1/2" 19 1/2" 20 1/2" 21 1/2"
Very quick, easy pattern to make. Great instructions. My wee grandson is the proud owner of three t-shirts with many more to come. Highly recommend this pattern. I loved the detail provided in this design, finding the grid particularly useful. 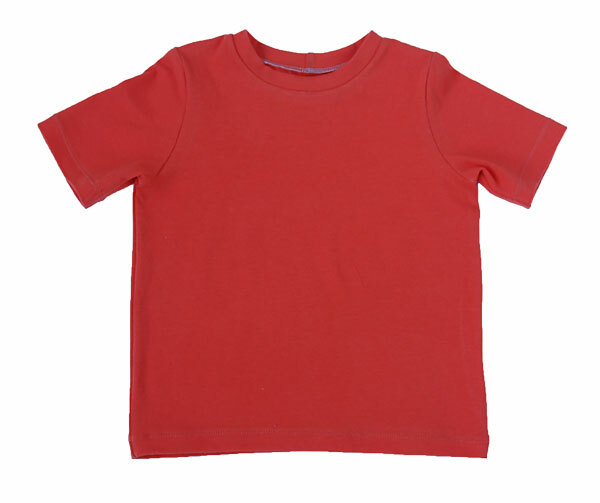 I made three short sleeved t-shirts for my toddler Grandson for Christmas. They turned out beautifully and were so quick and easy to make. I am sure I will be making many more over the coming years. So pleased I found this pattern. I really like the slimmer fit of this t-shirt. Having 6 grandkids, I have made it in 3 sizes using both short and long sleeve versions and both the regular and slimmer neckline self ribbing. I lengthened the sleeves because my granddaughter likes the sleeves on the longer side. Will go to the pattern more! The school bus t-shirt pattern was extremely easy to follow and super fast to construct. I've made two shirts for my daughter with it, and I will definitely be making more! I absolutely love this pattern! I've made 5 shirts from it already in the short time since I've purchased it! I made a size 4, short sleeve version for my grandson and it turned out great! Like all of Liesl's patterns is went together easily. My adult son asked me to make one for him :). 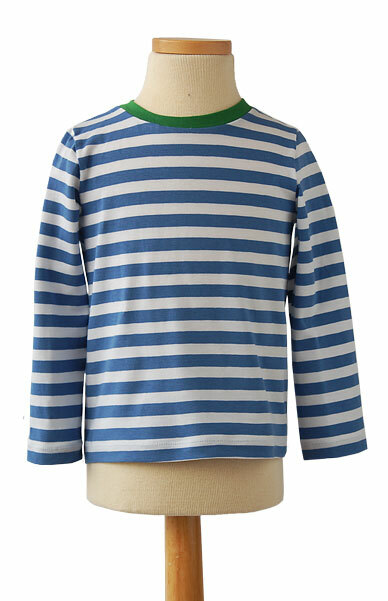 I made the long-sleeve version for a seven year old girl in a size 8 and, shortened it 3 cm, it was a perfect fit. I agree with Sarah: next time I'll lengthen the sleeves an inch or so. I'll definitely use this pattern again. This is a great pattern that I'll use often. 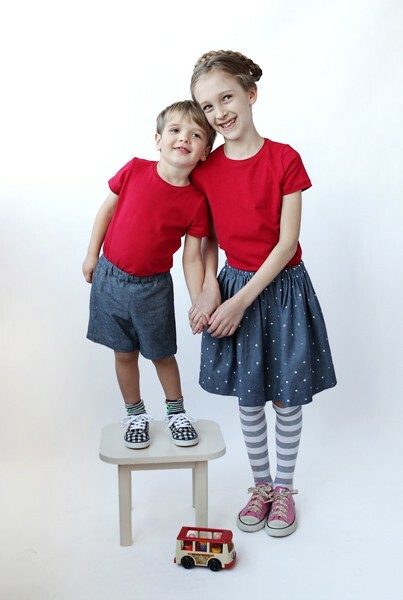 I made Christmas pj tops for a size 2 girl and size 5 boy, but modified them to add cuffs to the arms and waist. I also added 1/4 inch (size 6) to the size 5 as my grandson is a larger boy and I wanted the Pj to be a bit loose. They were a perfect fit and were red stripes and worn Christmas morning. I find this pattern easy to follow and the result is very fashionable as Oliver and S patterns are. I enjoy sewing with the patterns and have had lots of compliments. I am also a great fan of the Blog. So, I have made this shirt 3 times so far already- one for my 6yo daughter and 2 for my 8yo son. The only problem I would say it has is that the sleeve length was about 1- 1 1/2 inches too short. 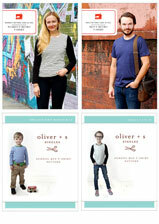 But as always, I do love Oliver & S' digital patterns and how they are laid out. I also appreciate that when I was taping the pattern together, I noticed they save you a couple pages by fitting in the center fold in some extra space that would have just gone to waste. I'm not used to that; I have bought several different digital patterns from other companys that pay no attention to save you on paper. Super appreciated that!!! Another great pattern from Oliver & S. Thoughtfully drafted with clear and helpful instructions. While I have enjoyed sewing all of the Oliver & S patterns I've purchased, I know that this one I will be sewing over and over again in the years to come. 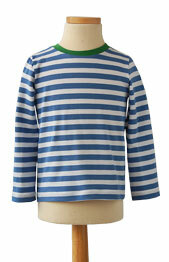 I made the school bus t-shirt in a 98% NZ merino wool jersey for my 2 and half year old grandson. I made the size three which was a little small on him but he is a very big boy and I could only take the fastest of measurements from him (so can't say they were accurate!). It's quite a slim fit, which is fine - that is the style. The pattern is straight forward and easy to follow. It's a great winter tee. 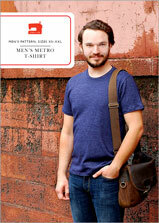 Fantastic slim-fit t-shirt pattern. Made four of these already for my 4 yo (size 5 fit him perfectly). Now to try out the Metro for my big fella. Love, love, love. 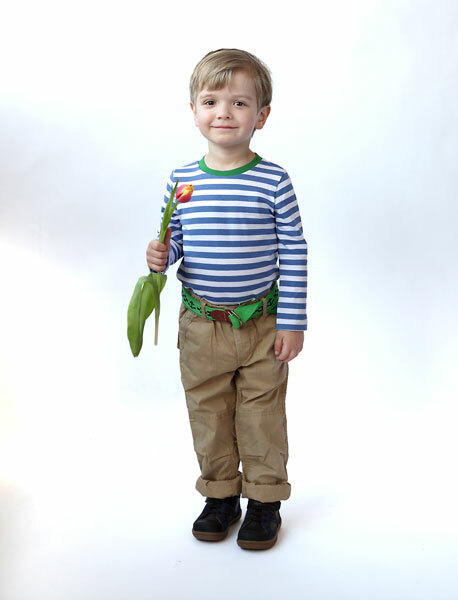 I have made 3 shirts from this pattern, 2 in the size 12-18 months and 1 in 4T. What I like about this pattern is the fit, very easy to understand instructions. What I don't like is that the shirt barely fits over my son's head (the 12-18 months). And by barely I mean it takes some effort to get it on. I modified by daughter's (4T) to have buttons on the shoulder seam and this fixed the problem. I have already made three versions of this pattern for my 12 and 8 years old. 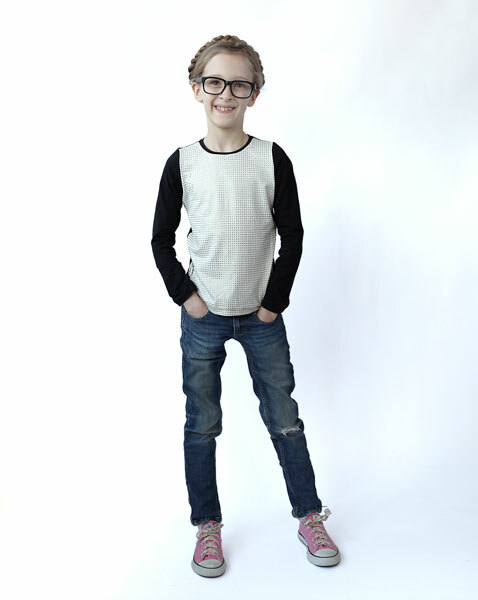 I found the fit quite slim so I went up a size for my youngest, who is not as thin as my older boy. I found the shoulders very narrow, but this is not a problem at all and the overall look of the tee shirt is great. It is really easy to customize and I have been playing with colour blocking, I also added self drafted elbow patches to one version. I would definetely recommend it! Excellent pattern and clearly written. I too love the simplicity of the design which fits little ones very well. 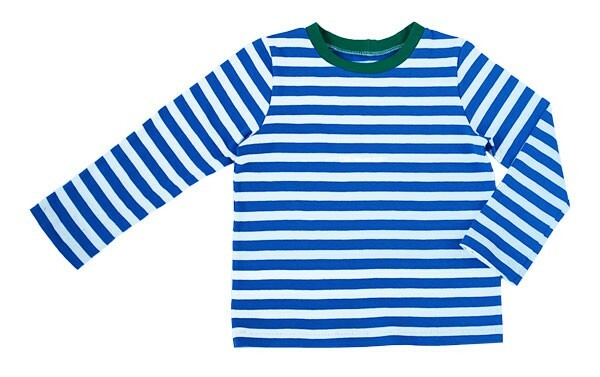 Suitable for boys and girls so very versatile. This is a very well written pattern. The directions are clear and easy to follow. I am giving this pattern 4 stars, however, because I would have like the pattern to have been drafted with 3/8' or 1/2' seam allowances to better accommodate serger use. I know I could add the extra seam allowance but I shouldn't have to. I have made at least five of t-shirts so far. The digital pattern was easily assembled, and the t-shirts are beautifully shaped. I've made versions for a baby, my 7yo daughter, my 6yo nephew, and my 10yo son. Liesl has such a nice eye for the subtle lines that make for a perfect shape. My little boy was given a couple of purchased t-shirts with his favourite cartoon characters but they were huge, quite a few sizes too big. So I decided I would cut them up and remake them to his size so he can wear them now. The first and last pattern I thought of was this one and it was absolutely perfect, everything went so smoothly and the finished result still looks like a purchased t-shirt! Not a glitch to be had. Sewed this up tonight for the first time. It was so quick and easy. Finished product looks great Andy daughter loves it. Another fabulous oliver and s pattern. I whipped up one of theses shirts the night before the first day of school. It went together really fast with everything lining up perfectly. I was concerned the neck would be tight over my 5-yr-old's enormous head but it worked fine. I sewed a size 5 for my average sized boy. The cut is slimmer than store-bought Ts but not tight. Not afraid of knits anymore! I used to be so leary of working with knits. 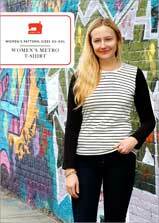 I bought this pattern and made the entire thing on my serger and LOVED the results. I'm just sad I only bought the one size and not the entire family pack! I bought this pattern (both size ranges) to adapt into Elsa costumes for various little girls in my life. It fit true to size, went together like a dream and was perfect for what I needed it to be! This is the first pattern I have bought from oliver & s. The pattern tiles are easy to put together. All the instructions were clear. I like how liesl explains why such-and-such step is necessary. The shirt turned out great! I made this tee in size 8 for my 8 year old daughter. It went together very nicely, as I've come to expect from every O+S pattern. The sizing is true to measurements, notches match up perfectly, and the directions are clear. I used both a serger and a traditional sewing machine to construct the shirt (pattern is appropriate for either). I would say this is for an advanced beginner, not because of the difficulty of the pattern, but due to the challenges of sewing with knits for beginners...you have to get the hang of it. This pattern is an excellent way to learn! I'm off to buy the women's version now. :-) Thanks, Liesl, for another wonderful sewing experience! 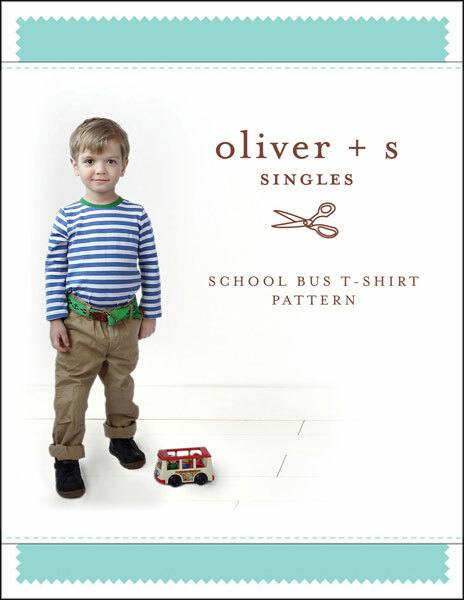 Discussion on the digital school bus t-shirt sewing pattern from the Oliver + S Discussion Forums. Find and share more photos on Instagram using the hashtags #schoolbustee and #oliverands.